Technical Note: For 1-piece crank seal. Lightweight nodular iron flyweel; weighs approximately 17 pounds. At the opposite end of the crankshaft is the flywheel. Connecting the engine to the manual transmission through the clutch assembly, the flywheel is a crucial part to the vehicles drivetrain. A proper flywheel works in conjunction with the clutch to lock on-to, to transfer power from the engine to the transmission. Chevrolet Performance offers both internally and externally balanced flywheels for small block and big block applications. 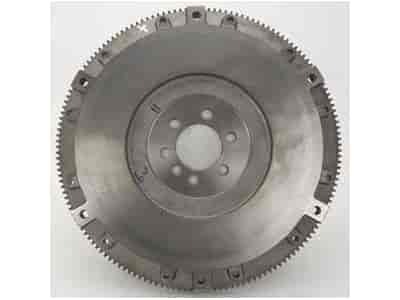 When replacing a clutch, replacing the flywheel is a great option to ensure the performance output from your engine is properly transferred. Chevrolet Performance delivers quality, reliable replacement parts for your performance needs. Note: Engines with one-piece crankshaft seals require externally balanced flywheels (except for ZZ427, ZZ572/620, ZZ572/720R and the Anniversary Edition 427).